The Taiwanese technology giant and one of the world’s leading Smartphone manufacturers, HTC is in the news yet again. And this time it is for its latest and technically advanced Smartphone, The HTC One. 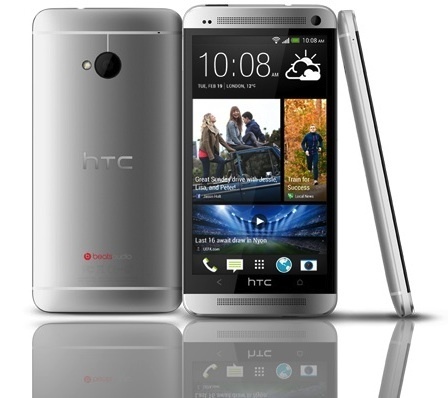 Yes, HTC has launched its much awaited Flagship Smartphone – The HTC One. The Smartphone, HTC One will be available across the world in the month of March. HTC One will come in two models of 32GB and 64GB and will be priced at $199.99 and $299.99 respectively. The features and specifications of HTC One are simply stunning and awesome. The phone is superbly designed with aluminium unibody and has been empowered with high-end and superior technology which makes it one of the most powerful and feature-rich Smartphones in the world. HTC One comes with a wide screen size of 4.7 inch and provides users with full HD Display of 1080p and has an awesome pixel density of 468 pixels per inch. Its LCD display has the SoLux technology which helps to output great picture quality and gives a superb viewing experience. The Smartphone is extremely sleek and has a stylish Rectangular and Flat design. You can expect a superfast performance from HTC One as it has been powered with Qualcomm Snapdragon 1.7GHz quad-core processor. As far as it’s operating system is concerned, HTC One runs on the latest 4.1 Jelly Bean Android OS and supports HTC Sense UI. Further, it has a RAM of 2GB and provides internal storage options of 32GB and 64GB. You also get to have a powerful rear as well as front camera. It has a 4MP rear camera which according to HTC is actually an UltraPixel camera due to its superior pixel quality. HTC One also has front facing camera of 2.1 MP. Together with this, camera has the BSI sensor, provides Optical Image Stabilization, Smart Flash facility, supports continuous shooting and slow motion video recording, as well. HTC One has numerous Connectivity Options such as Wi-Fi, Bluetooth, Micro-USB, GPS, Infrared, and NFC. It comes with a powerful battery of 2300mAh. Apart from the above features and specifications, HTC One comes with many other noteworthy features such as you can get live updates with HTC BlinkFeed, enhanced sound quality with HTC BoomSound, and much more. On the whole, HTC One brings a whole new and exciting approach to Smartphone usage and experience and delivers a stylish, feature-rich, advanced, and power packed Smartphone to the users. 1.7 GHz Snapdragon Quad-core processor. Now that HTC has announced the stock Android version of the HTC One, it looks like this is the best Android smartphone of 2013. Hopefully, HTC will release an AOSP ROM for early adopters who want to embrace this HTC One Nexus experience.